I did a bit of work involving MIDI equipment a few years back. Here’s a little debugging program that I wrote back then, which is useful now for when I want to have a quick play on my keyboard. 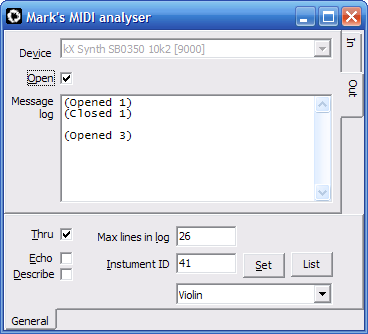 It allows me to quickly connect my MIDI controller to my Audigy2 synthesizer, behaving like an in-software “Thru” connection. It was never intended for other people to use so it looks ugly, but the readme file included should be sufficient to explain how to use the program. This entry was posted in Audio, Software, Windows and tagged controller, midi, midicom, music, software, thru on June 3, 2013 by Mark K Cowan.